So what did really happen? It seems strange that Baker should straight-up lie about not being able to be in Borderlands 3, so this might just be a simple case of people getting their wires crossed. Either way Pitchford says that it’s not really going to matter who voices Rhys as the character is due to appear in a specific, mysterious way. 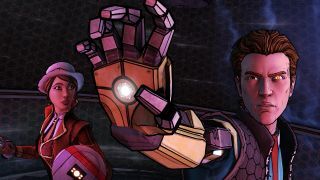 Maybe Rhys isn’t going to have his own voice at all, but be using the voice of Handsome Jack, as the AI might have found a way to gain control over Rhys like it originally intended. We’ll just have to wait and see what Pitchford means by this enigmatic tweet when Borderlands 3 comes out on September 13, 2019. No, I can’t wait either. Want more Borderlands 3 details? Here’s our Borderlands 3 trailer breakdown, or look below to see it in delicious video format!